Should you sign with your child? Signing while you talk encourages children to look at you while you are talking. This in turn helps them to see how to say different words and sounds clearly. Signing helps you as an adult to keep your sentences short and simple. This will help your child to understand you better. Signing helps you to speak more slowly. Being able to sign helps to reduce children’s frustration. The more they are able to communicate successfully, the more keen they will be to keep trying. We all learn best when things are presented in a variety of ways. Children with language difficulties often learn better visually than by what they hear. Signing a word as well as hearing it helps a child to remember words better. This helps them to be able to think of them when they want to say them. There is a lot more to language than just saying words. By communicating with sign language, children can learn about turn-taking, asking for things, commenting and even putting words together if their signing skills if their signing skills become advanced enough! With older and more verbal children, signing can also be useful at times. I often use some signs with children who have comprehension difficulties as a tool to help teach particular words and concepts. For example, I might use signs to help teach words such as big/little and in/on/under. I also often use signs for the question words to help children to understand which piece of information they are being asked for. What signing system should you use? Of course, children with hearing difficulties may learn BSL (British Sign Language) or ASL (American Sign Language) and use this instead of spoken language. BSL and ASL (and other equivalent national signing systems) are languages with their own grammar etc. They are designed to be used long-term as a main form of communication. 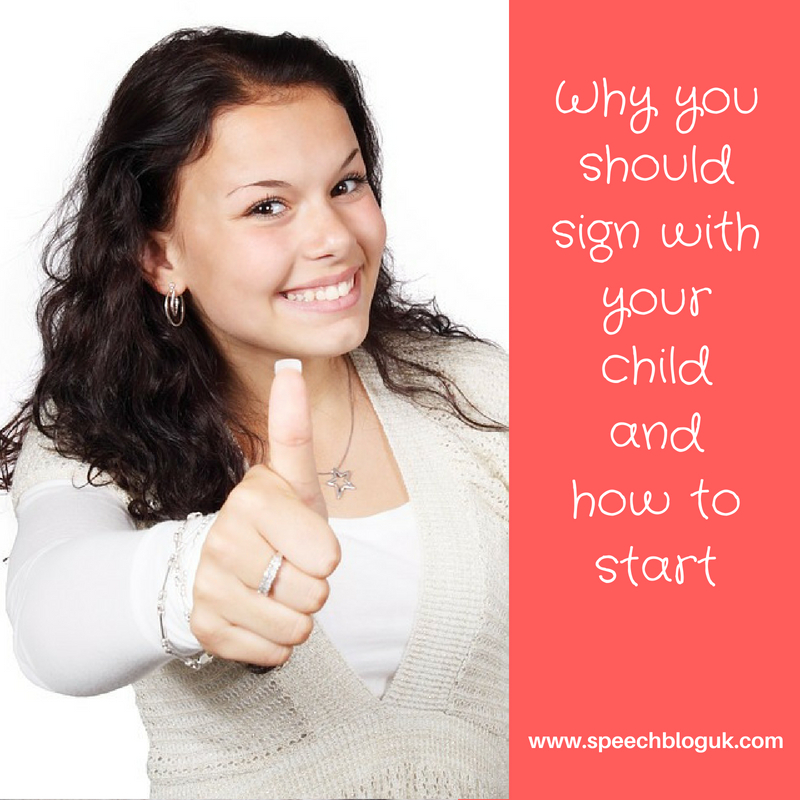 However, there are many signing systems which are really useful to use alongside speech for babies or people with language or learning difficulties. Sometimes these are adapted from full sign language. Others are developed from scratch. Here are some of the forms of sign language that are commonly used in the UK – Makaton, Sign-Supported English, Paget-Gorman Signed Speech, Signalong. This may all seem a bit overwhelming. Which system should you use? Makaton is probably the most widely used, especially in education settings. However, it doesn’t matter all that much. Many of the signs are very similar across different systems. It’s good to pick a system and stick to it so that it’s not confusing, but don’t worry too much – the most important thing is to do it. How can you introduce signing with a child? It’s a difficult thing to suddenly start signing and people often feel overwhelmed by the idea. So here are a few hints on how to introduce signing if your child’s speech and language therapist has suggested it, or it’s something you’d like to try while waiting for an assessment. Introduce a few signs at a time. Start with things that your child is motivated by and wants to be able to say. Use the signs as you are talking and hopefully your child may copy. This may take a while – they will need to see you use a sign lots of times before they give it a try themselves. If they still don’t copy you after lots of repetitions, try putting your hands over theirs and showing them how to sign. It doesn’t have to be perfect as long as it is understood. Don’t force this if your child doesn’t like it however. When you sign, always say the word as well. If your child signs without speaking to begin with, that’s fine. Praise the successful communication. When the pressure to be able to say words clearly has reduced, your child will almost certainly start to vocalise and experiment with saying the words as well. Don’t try to sign every word – just introduce a few signs at a time and try to use them as often as you can. You’ll never manage to sign everything and it would be just as overwhelming as a constant stream of language can be! How will you learn the signs to use? Makaton courses are great but can be hard to come by. Contact Makaton or your local speech therapy department for information about trainers and courses in your area. They also sell a range of books with the signs and symbols in. The programmes Something Special and Magic Hands are great for younger children and also free! Watch with your child and learn together! Some babysigning groups are fantastic for little ones. Tiny Talk for example, do courses for toddlers as well as babies. We also have a free handout about signing on our FREEBIES page. Do download and use it. Do you have any tips about how to introduce signing or stories of how it has helped your child? Do share them here. Thank you so much for posting this! I am always trying to teach parents that signs/gestures will help promote language development and not hinder it! I will be sure to show this post to parents in the future!